1. The amount of carbohydrate present. 2. The type of carbohydrate present. 3. The presence of other substances (soluble fiber for example) that slow metabolism of carbohydrates. For more information on Glycemic Index click here. The search for a low GI natural sugar based sweetener is somewhat futile as they all contain combinations of the above, or similar sugars. The University of Sydney publishes a searchable database containing the results of glycemic testing. Although fructose has a fairly low GI, it has other harmful effects and must be considered unsafe to take in large quantities. Agave Syrup has a low GI because it is mainly fructose. Agave has been delisted and banned by the Glycemic Research Institute of Washington DC because serious side effects were observed in clinical trials. Coconut Palm Sugar contains mainly sucrose and one would expect a GI of about 65. However it scores well in the glycemic index for sweeteners list. Tests have indicated a GI of only about 35. This may be partly because of other substances in it such as soluble fiber. However, the testing was very limited. More testing may well produce a higher GI. Yacon Syrup, scores best in the Glycemic Index for Sweeteners that are sugar based. It derives it's sweetness from Fructo-oligosaccharides, a type of sugar with a very low GI. It is probably the only truly raw, organic, natural, low calorie, and low glycemic sweetener available. Sugar alcohols tend to have very low GIs. In particular Erythritol has a GI of only 1, and it is a safe low calorie sweetener that occurs naturally in some fruits and mushrooms. While many of the other sugar alcohols also have low GIs they can have side effects such as abdominal cramping if taken in even moderate quantities. Both the natural zero calorie sweeteners such as Stevia, and the artificial ones such as Saccharin have no glycemic index. They do not raise blood sugar at all. This brings up another issue: The human body is programmed to react to the taste of sweet things. Studies have shown that insulin is secreted by the pancreas soon after the sweet taste is experienced on the tongue, whether the substance contains calories or not. The body is fooled by the zero calorie sweetener. It expects glucose to hit the bloodstream and it gets none. This may result in increased appetite soon after. 1. They do not cause a blood sugar spike and this alone is beneficial to health. 2. They are suitable for diabetics who would otherwise have a limited choice of sweet things. 3. They are harmless to teeth. 4. All things being equal they contain no calories and should be of assistance in a diet plan. Perhaps the best use of zero calorie sweeteners would be to reduce the sugars in food and beverages, not eliminate them. Say a person drinks a bottle of cola each day. This contains about 12.5 spoons of sugar and 200 calories. If they drank a reduced sugar cola made with half stevia or saccharin they would halve the amount of sugar, yet still receive a glucose boost. 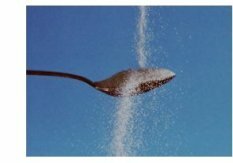 Indeed the lowering of the sugar intensity could provide a more steady supply of glucose to the bloodstream and dramatically reduce or eliminate the insulin load.